The Capsis Bristol is situated in Ladadika - the most live and colourful district of Thessaloniki. 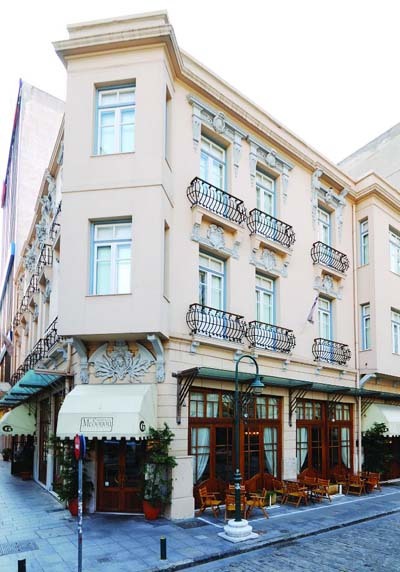 The historic building of this elegant, two-storey hotel used to house the Ottoman postal services and miraculously survived the catastrophic fire of 1917, which reduced a large part of the city to ashes. The hotel's central location, places it within easy reach of the International airport, museums, historical sites, shops and a wide variety of entertainment. 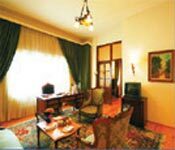 The hotel has 16 exquisitely decorated guest rooms and 4 suites. Double glazing effectively insulates the rooms from outside noise and the shiny parquet floors are adorned with unique, hand-woven Bukhara rugs. Handmade furniture - many pieces of which are carefully selected antiques - provides a comfortable, homely atmosphere and the colour of the cotton bed sheets changes daily. The lighting fixtures, also antiques, are true works of art, each one quite unique. The desktop accessories are of leather, while the attractive appearance of the marble bathrooms is supplemented by a hair dryer and luxury toiletries. The mini-bar, television (TFT screen), direct dial telephones (with a separate line for Internet access) and air-conditioning add to the list of amenities required by the modern-day traveller. The Capsis Bristol is protected by a modern fire-protection system and is the only one in Greece with an adjustable fire detection system in all rooms. Seven chandeliers adorn the common areas of the hotel, while the old marble staircase is typical of the harmonious union of past and present. Of course, the hotel caters to the needs of modern-day travellers, having an automatic telephone exchange with ISDN network, electronic door locks, as well as an electronic system for taking orders. The hotel is specially equipped to serve the needs of physically challenged persons. In the centre of the building, warm sunlight and impressive murals by Kyriakos Georgiadis help give a bright start to the day. Guests can enjoy the Argentinean tango’s melody in the Fernando’s Italo-Argentinean restaurant with its fine selection of aromatic coffees, fine wines, and delicious ethnic dishes. The Argentinean chef’s culinary expertise guarantees the highest quality recipes that convey the flavour of Latin America and North Italy. The "Thessaloniki" room - with its exquisite handmade oval table and comfortable armchairs - is available for business meetings of up to twelve people. Lighting is provided by an impressive 19th century chandelier. The room is equipped with video and TV and has a special point for charging mobile phones, as well as a special secretarial position. 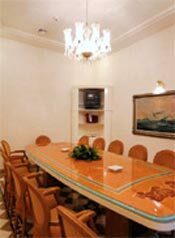 A second room - the 'Rotonda' - can serve similar needs of up to twenty persons. Small tables and attractive chairs provide warmth and a unique atmosphere for all types of meetings. An impressive desk and armchairs dominate the room.